Five years. Five long years.. (pensive pause). I can't believe it either. I think it's gone pretty quick though. Actually, every week passes by so quickly that I'm finding myself far behind with updating posts. Generally my enthusiasm has waned a tad, and I become every day just that little bit more cynical of these people I live and work amongst. The new working year started great when I got thrown a bone of an extra twenty yen an hour. This is pretty much the norm. Oh, until I found out others were getting more. It was great that I got a bonus for sticking it out after "the big one". (That was a joke. Are you kidding? They used that as an excuse NOT to give us the stipend anymore). How fantastic is that? After the Kanto area manager gave a morale boosting speech of how bad we were doing compared to Kansai, one can get the feeling that if they didn't need native English teachers they'd rather do without us. They say the aim was two and a half different schools.. I get four. Two of those are at schools pretty far away, and were definitely NOT requested so, so much for request surveys. My Wednesdays at the moment are lonesome affairs at the park. No one I know has the same day off, so it's going to be great in the Summer going to the beach. Right? I've been meeting at lot of new people at the bars, but rather than being the Charisma Man I thought I was, I'm excellent free English practice. Even the boys think so too. The smoking is really getting to me. It's great having smoke blown into my face, or even how they thoughtfully rest a lit cigarette on the tray to let wisps of smoke waft towards me. I look forward to the day Japan taxes the crap out of cigarettes and bans smoking INDOORS just as Australia did many, many years ago. Likely not going to happen in my lifetime. It's going to be stinkin' hot in my new apartment. I haven't been searched by police on the street, but I have had a house call, because they want to know where I live, even though the ward office and the government actually already have those details. hmm. Good things? Yeah for sure! I love having two empty seats next to me on the train. Reverse racism has its benefits too! Although I have had solo outings at the park, I still find it calming. Apart from the kids classes where I've felt like I'm just babysitting, I've enjoyed the majority of my lessons. Still wish I'd learnt more Japanese in this time. Best thing I did was shave my head. It was cathartic. Totally necessary. I think I need to do one crazy thing every year to keep me sane. I think my time in Japan is limited. I'm really hoping there won't be a year six post. The payoff is virtually non-existant, and the rewards are few. I'm here because I don't know what I want to do, and I've made some good friends here. And.. one my best friends. I don't want to lose that. Although it's great having a week off for Golden Week, it's been not so great weather to do something interesting. The days following had mostly rainy days keeping me inside. Today was an exception. A top of 26 degrees C and the brightest full moon of the year. A couple of things we had in mind. First going to Wakasu to see not only the new Tokyo Gate Bridge and the large windmill power generator, but also to see the resurrected 1/1 scale Gundam model in Odaiba. 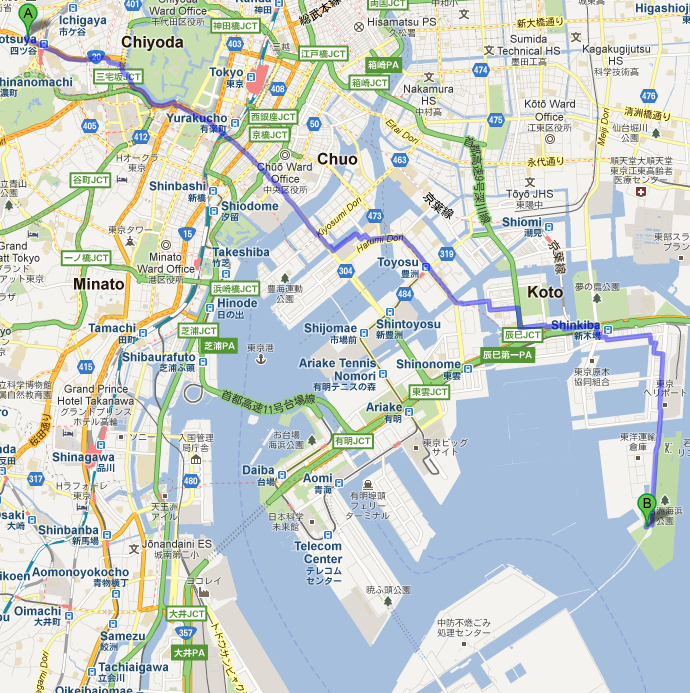 The purple line you see on the map shows the 16km journey to Wakasu to be an almost straight bee-line there. We went by Tsukiji, where I've been telling myself for ages to go check out the famous fish markets. In many parts of the trip, it was hard not to miss the Tokyo Sky Tree. Across the bridge leading into Toyosu I noticed the adjacent railway bridge, from my interest in haikyo. Although it didn't look too hard to jump the fence and ignore the simple warning, I didn't feel the need to get closer, unlike this guy who actually went on it to take pictures. I could see all I needed to see, and it would be quite obvious to the passers by on the existing, busy bridge. Further along I saw the Tatsumi International Swimming Center. 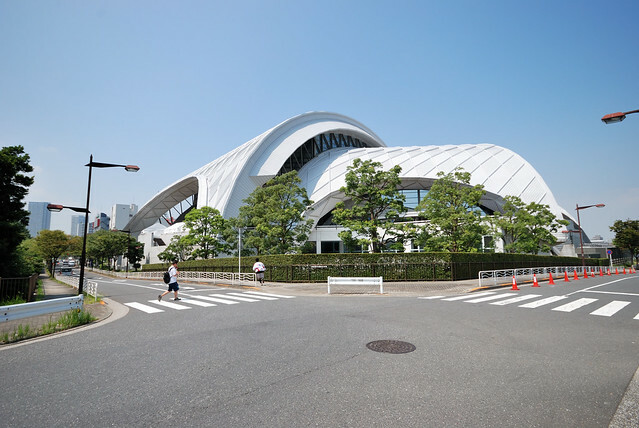 Just like Pacifico in Yokohama, it reminded me of the Sydney Opera House with its white and quirky architecture. As we hooked a right turn from Shin Kiba we noticed quite a few people around here. While the new Tokyo Gate Bridge is the big current news, I was actually a little more interested to see the windmill. As we were getting closer and closer, I was keeping a sharp lookout for those enormous blades. Around Yokohama there is also a wind power generator that could teasingly be seen from Minato Mirai. It's in Suzushigecho, but it's on US Army property so prohibited to get up close. What makes this one different is that it is situated unobstructed in the middle of Wakasu park! I took a LOT of photos. I even made a video to show its slow rotation and the swooshing sound. If it couldn't be cool enough, it even has Astroboy on it. This video gives a more moody interpretation of this windmill than mine. From there we made our way to Tokyo Gate Bridge. This has only recently been opened (12 Feb 2012), so interest is still very high. There is an elevator to take you up to the walkway, but the long line made it easy to just use the stairwell. First thing I noticed was the wind. It's SO windy up there. Much more so, than the Rainbow Bridge. Secondly, there is a non-stop passing of planes on their way to Haneda Airport. The view is quite nice though. You can see a great panoramic view from here. From the bridge it looks like there are also two other wind power generators on the artificial island coming off the other side of the bridge, but we only went half way, so hard to say if it's possible to get close. One day I may go to the Kamisu wind farm but it's pretty far away from Tokyo in Ibaraki prefecture. While it may be possible to go to Odaiba from the other side, we went back towards Shin Kiba. Before going back however, we decided to have a short look around the narrow jetty, where there were plenty of fishermen. Be careful of the rush on the waves coming through the grate! I had a bit of deja vu going to Odaiba via Shin Kiba. There we were passing the wasteland of a Tokyo industrial area. Seemed quicker this time. I was sober at least. I had to ask some otaku boys where Gundam was. Strangely enough they only knew where it was when I mentioned the building it was next to. 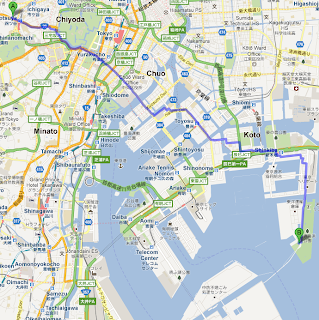 You can find it if you look for Aomi on Google Maps, about a 5 minute walk from Daiba Station on the Yurikamome line. It's outside the new Diver City ("Diversity", get it?). Funnily enough it is not far from where it was temporarily displayed in Shiokaze Park back in 2009. I always thought Odaiba was a perfect place for Gundam, so it's great to see it back. I didn't know about it, but there is an Oktoberfest here too. Food and drinks were crazily overpriced, but by looking at the crowd, it looks like they don't really mind. They didn't notice it wasn't anywhere near October either. We explored nearby. The Tokyo International Exchange Center looks like a PCB or computer circuit board to me. I don't know if that was the architect's intention, but it looked fitting in Tokyo's odaiba area. Speaking of things looking like other things, the Maritime Museum does a pretty good job of looking like a ship. We went further along the Telecom Center area seeing other interesting buildings, harbour cranes and some.. cats. As it got darker we went along the Daiba waterfront. I still find it hilarious that they have a Statue of Liberty here. In front of the cool Fuji TV building. Making our way back, we went via the Rainbow Bridge. Maybe it's just because it's the holidays, but it seems like more people are trekking across the bridge than when I first crossed it. My little "secret" is out. Inside of going through Tamachi, and the hilly Roppongi area, I find it much easier going north to Shiodome and Shinbashi where although a little longer, is flatter and easier to manage. Wow. Long post. Well, it's been a while since I last posted, so I guess this makes up for it.